My family and I contracted Andrea’s services for the day of coordinating. We found her to be extremely friendly, professional and most importantly reliable. She was able to coordinate all my vendors ahead of time so I had no worries the day of. She foresaw possible problems and resolved them before they became an issue. She really came through when we needed her to handle last minute details. As a destination bride, I needed a coordinator who was flexible and able to contact me by phone and email as well as work, with not only myself when I was in town, but various family members. Andrea handled this wonderfully. My family and I loved working with her and would recommend her services 110%. Pepper and I want thank you so very much for ensuring that our wedding day was an amazing, unforgettable experience. You truly went above and beyond to make sure that we were stress-free and able to enjoy every minute of our big day! We are so appreciative of every detail, every urgency, and each and every minute of your help. Almost everyone who attended said that it was the most beautiful wedding they had ever attended, and we owe it all to you. 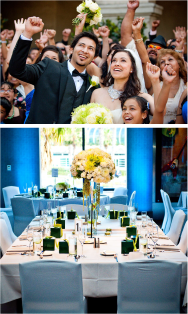 You are an amazing wedding coordinator and it shows that you love and exceed in what you do. I would highly recommend you to anyone, anytime, anyplace. Not only did we love working with you, but several of veteran vendors remarked that they LOVED working with you and were impressed by your professionalism. I could not have pulled this off without you and am so grateful to have worked with you! Again, thank you for making this truly the best day of our lives!! !